← It’s in the bag! With the holidays come holiday parties, including the penultimate holiday soiree, the New Years Eve Party. 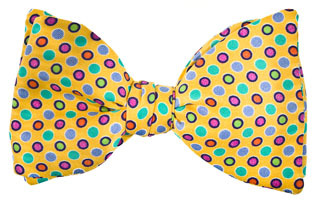 I don’t know about you, but I think there is nothing as cheery and at the same time stylish as a good bow tie. Bow ties just scream “I am ready to party” in my book. And do I have a firm that knows its bow ties: Carrot & Gibbs. 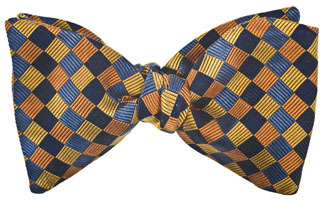 The Carrot & Gibbs bow tie is the sixth item on my top ten Made in America holiday gifts for 2011. In contrast to those that wear the bow today, the original bow tie wearers were not very civilized. According to Wikipedia, Croatian mercenaries first began sporting bow ties during the Prussian wars of the 17th century. The French, ever on the lookout for a way to be, well French, adopted the bow fashion. Upper classes Frenchmen made the bow tie a required piece of French fashion in 18th and 19th centuries. The French named the tie “cravat” derived from the French word of Croat. It is unclear whether the Croatian mercenaries ever got a cut of the French bow tie trade. Carrot & Gibbs bows are truly unique. 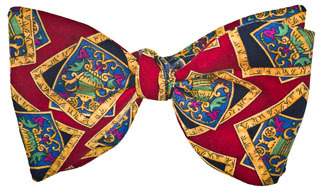 For this holiday season, Carrot & Gibbs have produced some amazing new bows. My current favorite is the Elegant square emblems on rich red ground. Another design that just screams, “I am a fella who can pull this off, you, maybe not so much” is the green, blue, and red dots on a yellow ground. Finally, if you want a bow that is a bit more sedate, I might suggest the blue, black gold, and copper checks. Which ever Carrot & Gibbs bow you buy for your husband, father, brother, uncle or son, you can rest assured that it will be worn with pride. You can also be sure that it was crafted in this country by a member of your extended American family. Go ahead, tie one on. Just do it in front of a mirror the first time and never when driving a motor vehicle. Get shopping! This entry was posted in american made, Apparel, gifts, Made in America, Men's Wear and tagged Bow tie, Nordstrom, Saks Fifth Avenue. Bookmark the permalink. 2 Responses to Fit to be tied! I have linked this blog entry from my blog. Good work. -Jack A.